A long list of comedians on summer music festival posters is now common place. Latitude Festival, held in mid July, boasts the largest collection of comics and is considered by many to be the best non-comedy comedy festival in the country. The recent V Festival had the likes of Adam Hills, Josh Widdicombe and Bill Bailey named alongside those of pop icons Justin Beiber and Rihanna. 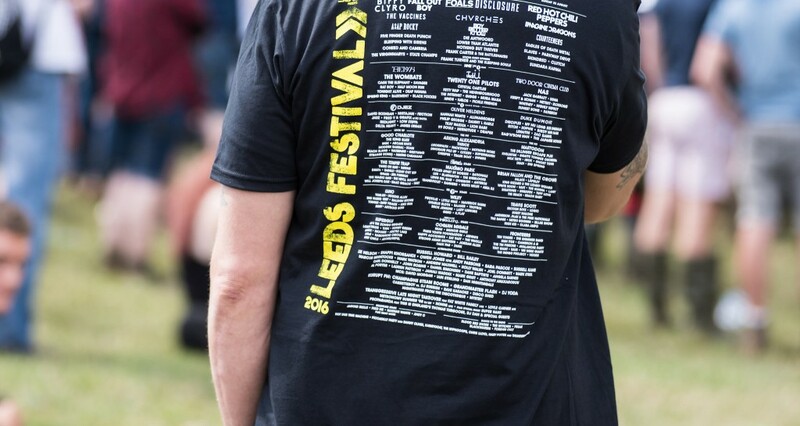 In line with the organiser’s approach to programming the music, the Reading and Leeds Festival comedy listings are closely mirrored on alternate days as many of the acts are booked to appear at both festivals. We went to the first two days of the three day festival in Leeds. On entering the marquee for the Alternative Tent, it soon became apparent that the comedy programme was not really set up for the regular comedy fan. Screens either side of a stage gave it a bit of a rock show atmosphere. There is no seating so to speak. Neither had there been any covering placed on the bare grass field. It was clear why it has to be set up this way – the organisers were focusing on their music audience. With a multitude of stages and attractions the festival goers constantly moved around. Folks were looking to fill a gap between favourite bands and consequently were quite happy to wander in and out of the comedy tent. Audience turnover between, and even during, the shows was considerable. For the comedy fan there was the advantage that for five hours during the day the Alternative Stage provided a continual parade of headlining acts – a super extended mix bill. The host for Day 1 was David Morgan, most familiar as the resident comedian on ITV2’s I’m A Celebrity Get Me Out of Here Now. Throughout the afternoon he performed a standard MC’s role and cheerfully chatted to audience members. He deserved credit for not seeming daunted by the fact that he only had 14 in the audience when he first walked on stage. He welcomed newcomers and encouraging passers-by, raised this to around 100 before he introduced the first act, Andrew Maxwell. More people continued to arrive during Andrew Maxwell’s forty minutes performance. This prompted lots of tongue in cheek banter about the security guards having to ‘hold back the crowds.’ Maxwell played down his effectiveness saying how crazy he was for accepting a noon show in Leeds and being shattered by staying up until 3am in Edinburgh. However, you could almost see the cogs turning in his head as he pulled out all the stops to lift the crowd. He hit the spot three quarters of the way through with a sequence of impersonations of musical instruments. He even ran over-time saying, “That’s a sign of a good gig.” He was a good choice for an opening act. The second act, Mark Watson, continued the theme of how hard a gig this was for comics saying that an hour earlier the acts backstage were thinking about faking their own deaths. However, by that time the marquee was filling and Watson rattled out some of his best routines from his recent shows. He pulled apart pop lyrics, told how he didn’t wear a watch and more personal stories about how he used to have to drink to beat his anxiety and nerves before getting on stage. Using the excuse of it being a music festival he also sang a silly song about the joy of bouncy castles. Jamali Maddix is shaping up to become a major player on the comedy scene. In August he performed his debut hour at the Edinburgh Festival. It would have been easy to mistake him for a much more experienced comic. He was not as well known as the previous comics, but he was of the same generation as most of the audience. He went down very well with tales about Tinder and of being of mixed race. He chatted to the audience with confidence and drew big laughs when he wore a straw hat obtained from a member of the audience. Making a welcome return to live comedy after an eight month break to have a baby Holy Walsh looked like ‘the girl next door.’ She excused her squeaky voice, which is not the sort of tone you would expect to hear swear words spoken. Her act was very engaging. It was peppered with audience banter, chat with the security team and included PowerPoint slides showing a series of comic venn diagrams. The highlight of her set was at the end when she played ‘Festival Guess Who’ when she managed to persuade everyone sit down as they met her selection criteria. The winner was a man wearing a monkey mask! Kane’s wife, Lindsey (a Northern lass) came in for some stick. Kane weaved through a series of jokes based around the theme that some of us are neurotic whereas others are chilled. His theory was that each type need each other to get by. Between the first and second days comedy sessions the Alternative Stage became a dance floor so it was no surprise to find the audience area covered in mud for day two of the comedy. MC for day 2, Iain Sterling, is a very likable comic who played up the fact his persona as a stand-up is quite different from that as a BAFTA nominated children’s entertainer and the voice of the Love Island reality TV show. The opening spot of Day 2 showed that a good cross section of young people are interested in politics. Owen Jones, author of several books, columnist for the Guardian and a frequent broadcaster was in conversation with Andy Parsons in front of a busy crowd for a noon start. With Andy Parsons in charge, there was little chance that the chat would go on too long before there was a good laugh. The two were ideally pitched together, and the jokes were all in context with the serious points being made. Picking the tempo up further Shappi Khorsandi opened to a massive cheer with, “You are at a music festival, but you are in the comedy tent. You are my kind of people!” Shappi was proud to be a single mum bringing up a boy and a girl. She told us with great hilarity that her children were quite different. The boy acts very English whereas the girl takes a Iranian view of the world. We were reminded though that she had lived in England for forty years, which is longer than the age she claims to be. One of the highlights of the delightful set was a story about her embarrassment at meeting Jeremy Corbyn for a second time, after 20 years, when he remembered the white lie she told him at their first meeting. Sara Pascoe is another likable comedian, but she could have lost a more hostile crowd when she walked on stage saying that it was lovely to be at Reading. She recovered well as she told a series of stories, that struck a chord with the young Leeds audience, about thinking she’d joined the mile high club, Uber drivers, writing to a prisoner on death row and accidentally watching a TV series in reverse. Angela Barnes first gained widespread attention as the 2011 BBC New Comedy Award winner. Angela and her witty world view have since been catapulted onto numerous radio and television shows. She very much connected with the audience telling stories about not wanting children, Donald Trump, loving to receive badges and moving in with her boyfriend. Without a doubt Mark Steel is one of our finest comics and his hilarious views on the political landscape have won him fans who fill theatres on his tours of the UK. His difficulty with this gig was that he was in front of a packed room full of people, well outside his usual demographic, eager to see Russell Howard. No one could fault his work rate and commitment as he spoke about the way the older generation had let down the youth of the UK. The festival headline comedian was Russell Howard. When you see Russell Howard perform live, it is easier to understand why he has reached such dizzy heights. During this 45 minute set he had incredible stage presence and drew laughter from the smallest of things. During the previous month, he had been performing daily in Edinburgh preparing material for a world-wide tour. The set pieces he performed in Leeds were material garnered from that process. What places Russell Howard apart is how expertly he can pick up on a small idea in the moment and run with it, instantly reeling out a series of gags that take a show to a new height. During this show this ability was demonstrated on several occasions, especially when he spoke to a man in the audience who was wearing a banana suit. So, what’s the answer to the obvious question – is attending Leeds Festival a good way to see comedy? Certainly a high proportion of the acts mentioned on stage that it was the weirdest gig they had ever done. It was an environment where only strong acts that could connect to a youthful audience could comfortably reach the end of their set punching the air. But if you could go with the flow, ignore the very loud drum and base music playing in the background, were happy to stand in a muddy field, and if you didn’t mind the majority of the people you are rubbing shoulders with being of an age where they have just received their GCSE results, then it was well worth giving it a try. For me, yes -I’m glad I stood through two afternoons in a muddy tent, amongst an amiable bunch of young people, to end up seeing Russell Howard (even though I’d seen him two weeks earlier in a comfy seat in Edinburgh) surprise me by delivering a unique brainstorming live performance. If you go next year, along the way you might also just happen to pass another stage and see one of your favourite bands playing live.